I offer five DVD titles for sale on my site. Click on any selection below for more information, clips and prices. I also offer Downloads of certain titles. Sale of the Michigan Central Train Station... Sale!. Usually $20.00, ON SALE for $16.00, 20% off! 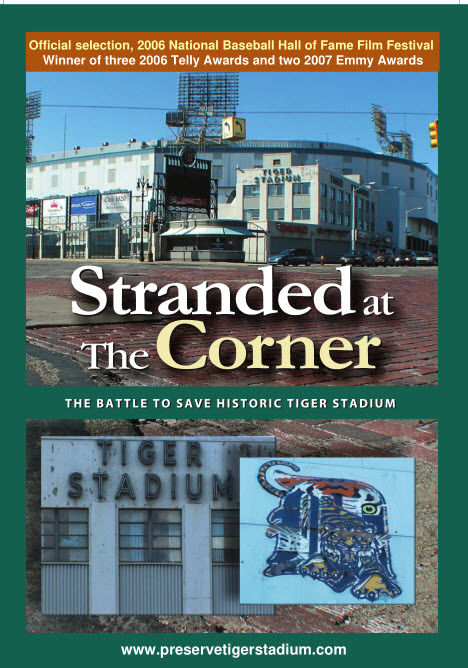 The Emmy Wining "Borderline: The Story of 8 Mile Road", the very popular "The Hudson's Building" (a favorite at Detroit Historical Museum screenings), and Train Station (Michigan Central Train Depot), a documentary shot in 1998 and released in 2004 . To view clips from this DVD, use the playlist. click here to read articles, reviews etc. This highly acclaimed production (3 Telly Awards, 2 Emmy's, 11 Emmy nominations) tells the story of baseball's oldest field and the backstage maneuvering that led to its abandonment. For over fifty years Eric and Ann Brown have lived in a Frank Lloyd Wright home in the Parkwyn district of Kalamazoo, Michigan. The Home was kept to the exact design elements as dictated by the architect. Featuring rare photos of Frank Lloyd Wright in Kalamazoo, personal correspondence between the family and the architect, and interviews with three generations, this documentary is an endearing portrait of one Kalamazoo's preeminent families and the home they loved. From tagging to piecing, this controversial documentary chronicles some of L.A.'s hottest graffitti writers and crews. Shot from a graffitti writers perspective, the question of whether it's art or vandalism is left for you to decide. Segments were featured on NBC News/Today Show. "An audio & video feast..."
Los Angeles skid row is the setting for this multi-award winning production. A spirited group of homeless people attempt to create their own community in response to dangerous and overcrowded conditions at area shelters.